RangeRoller TM is the innovative mulit-layer therapy roller with a range of possibilities. RangeRoller’s exclusive Trigger TreadsTM enable you to reach deep-massaging both outer and inner layers of muscle and connective tissue to increase circulation, relieve knots, warm muscles, eliminate scar tissue and improve overall performance. The Pro 16” is the firmest RangeRoller we make. 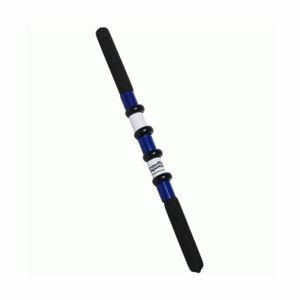 Its 16” length and thick inner rod provide a very deep massage. The Pro is perfect for the athlete that needs to get deep into a specific portion of the muscle. It is suggested for the heavier athlete as well as the athlete with an above average amount of muscle mass. Use the RangeRoller anytime you feel: • Fatigue • Muscle pain • Spasms or cramps • Tension • Soreness Innovative Design RangeRoller’s non-slip grip handles and light-weight design enhance control, prevent muscle fatigue and maximize roller performance.